A ground-breaking project in Gweru to breed endangered lions in captivity for release into the wild has shown early signs of success. A pride of seven lions released into a controlled ecosystem at Antelope Park on the outskirts of the city in 2010 has adapted well to life in the wilderness, a park official said. The lions � a product of Antelope Park�s lion breeding research project � were released in September, 2010 by the then Minister of Environment and Natural Resources Francis Nhema. Gerald Bongani Mutimbiri, a Field Guide at Antelope, said the lions have since increased to 12 after giving birth to five cubs in the wilderness. �The seven lions have adapted to life in the wilderness as they can now hunt prey. Their cubs are unlike their parents as they were born free of human interaction. However, we have eleven lions in the controlled ecosystem as the fifth cub, Narnia, was attacked by a disease and had to be removed to a controlled enclosure. The enclosure shares a boundary fence with the manageable ecosystem so that she bonds with other lions. This (the lion rehabilitation project) is a process. It�s done in stages and the lions are coping well following their release into the wilderness in 2010,� he said. The lions were released into a 500 acre Ngamo Release Site, a managed ecosystem where the park authorities introduced zebras, impalas and wildebeest for the lions to hone their hunting skills. Mutimbiri said the project of breeding lions is supposed to be done in four stages but Antelope Park could only go as far as the second stage owing mainly to land challenges. �The first stage in rehabilitating the lions back into the wilderness is the breeding stage. After three weeks we take them away from their mothers to spend time with our lion manager or lion handlers. Mutimbiri said at six to 18 months the lions are taken for the famous lion walk where even tourists get the opportunity to walk with the dreaded king of the jungle. Stage two of rehabilitating the lions is releasing them into a controlled ecosystem where they hunt for food. The process is monitored by a research team which seeks to establish whether the lions are coping with life in the �jungle�. Mutimbiri said the manageable ecosystem is deprived of competitive predators like hyenas to allow the released lions to adjust to life in the jungle. �We only introduce other scavengers like hyenas at stage three. Stage three needs a bigger space as it is supposed to accommodate more animals. We got land in Victoria Falls in the Chama Bonda area but we need funds to fence it. This is what is stopping us mainly,� he said. Only cubs born in the jungle will be released for stage four which is the proper jungle � national parks like Gonarezhou. Mutimbiri said the seven lions released in the wilderness in 2010 will remain in stage three while their cubs born in the wilderness proceed to national parks. 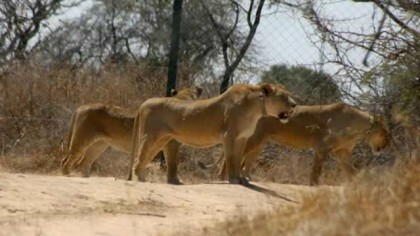 He said the project was part of efforts to rebuild depleting numbers of lions in Zimbabwe and Africa. The lion population in Africa stood at 230,000 about 40 years ago but the number has since been reduced to less than 20,000 due to natural and human causative factors. Mutimbiri said the Antelope Park lion project was playing a multi-purpose role of promoting tourism, educating and preserving the country�s wild life for future generations. �We have wildlife and tourism students from tertiary institutions like MSU and Nust who come here for attachment. They learn a lot about wild life management. We also promote tourism through our lion walks, and the exclusive night encounters. We are also preserving the lion for future generations,� he said. Mutimbiri said the Antelope Park lion project was a non-profit making venture whose operations were sustained by tourists and funds raised through the Park�s lodges, among others. �What we want to achieve as Antelope Park is to release lions back into the wilderness. Burundi was left without lions after years of civil war. They approached us and showed interest in our lion breeding project. �We are supposed to export lions there but we need a permit from the Parks and Wildlife Management Authority first before we can do that. We will export lions at stage three or four once we get clearance,� he said.